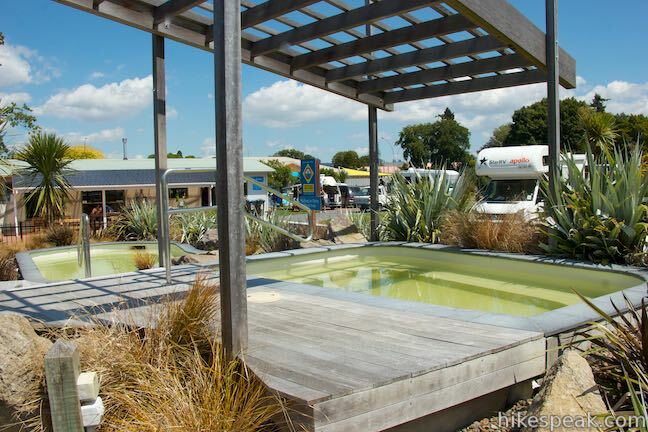 Rotorua is an adventurous city on the North Island of New Zealand. 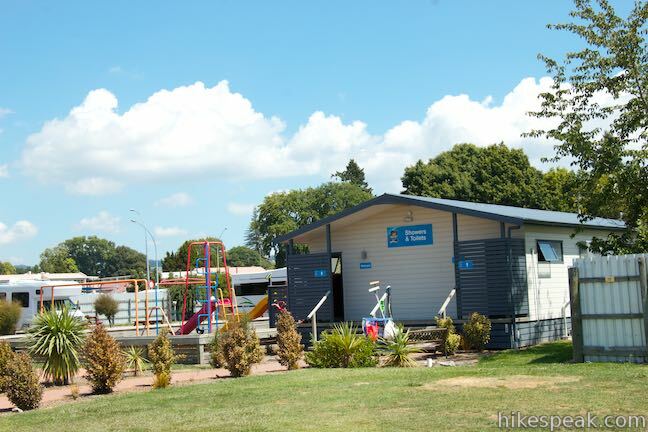 The Rotorua Top 10 Holiday Park takes on that fun energy. 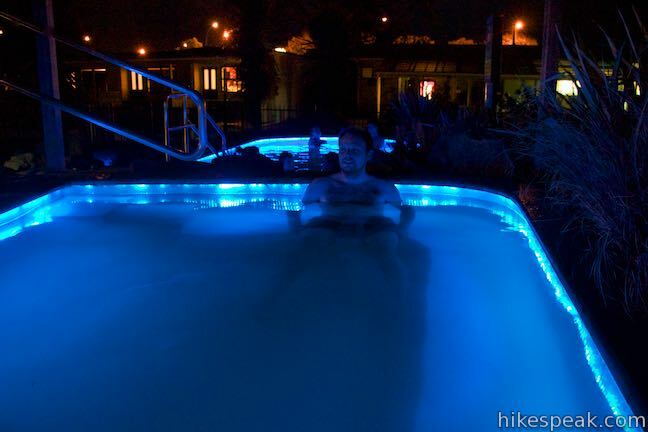 Pop tunes play in the bathrooms and the mineral pool (free to guests) is lit with LED rope lights in the evenings. 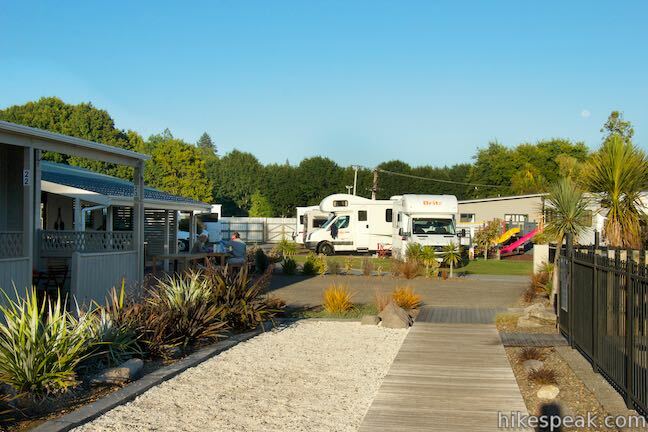 The holiday park is a convenient place to stay near the center of Rotorua, offering a variety of accommodations, including motel rooms, cabins, and campsites. 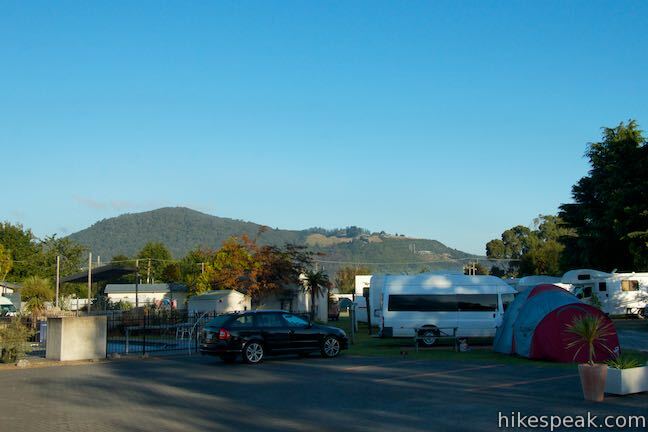 Rotorua Top Ten Holiday Park has powered sites for campervans and RVs and tent sites that are unpowered. Each powered site has an electrical hook-up and sits on grass or a hard surface. Sites also have picnic tables and water spigots. 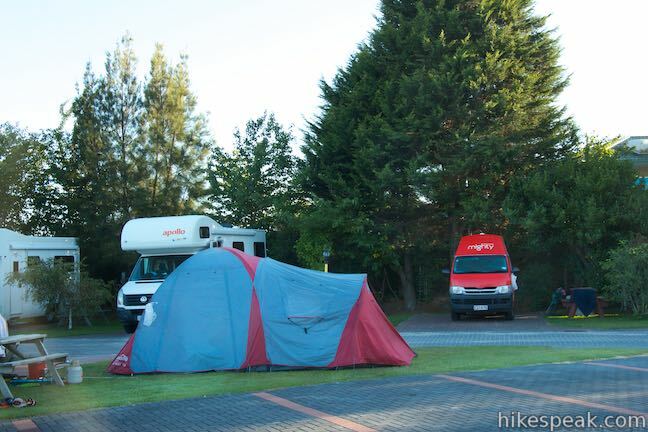 The tent sites are all on grass. The park has nearly 200 sites in all and they are pretty close together. 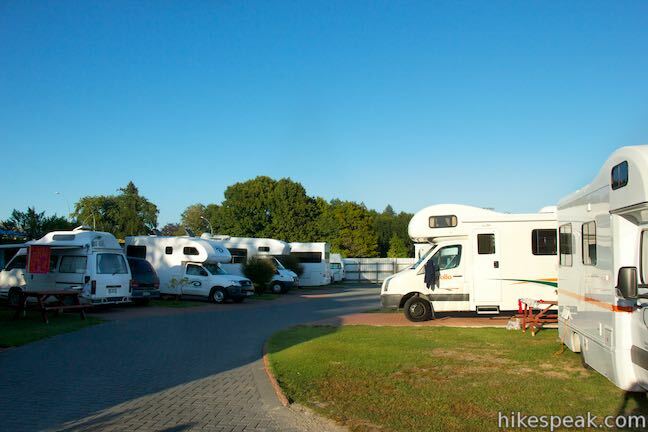 The holiday park is right in the city, so the layout is fairly compact and privacy is limited. 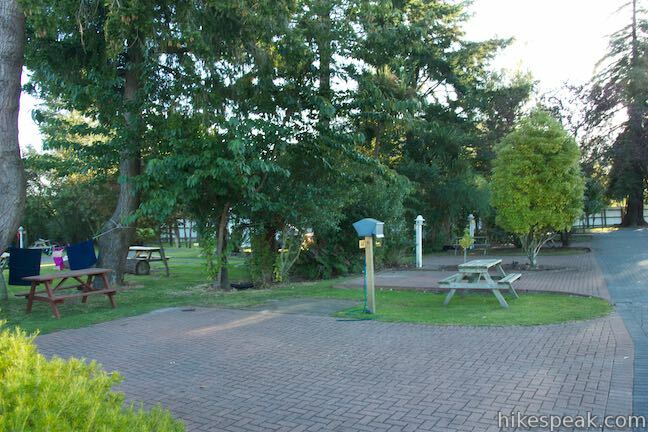 The rate for powered and non-powered sites varies throughout the season and is around $40 to $55 per night for the first two adults, along with additional charges for extra adults and children. 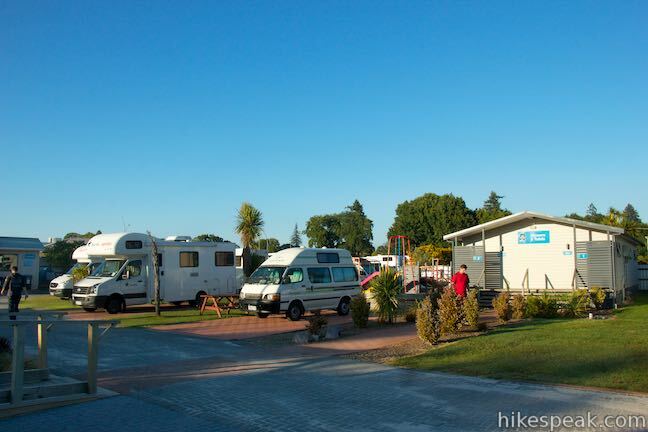 Within the holiday park, campers have access to communal bathrooms with free hot showers, coin-operated laundry, kitchen and dining areas, barbecue grills, a dump station with cleaning bay, lounge with couches and a 50″ TV, wireless internet (pay), swimming pool (summer season), thermal mineral pools, playground, and a petanque (bocce) court. In the bathrooms, radios broadcast the latest hits, so you can sing along during your shower. 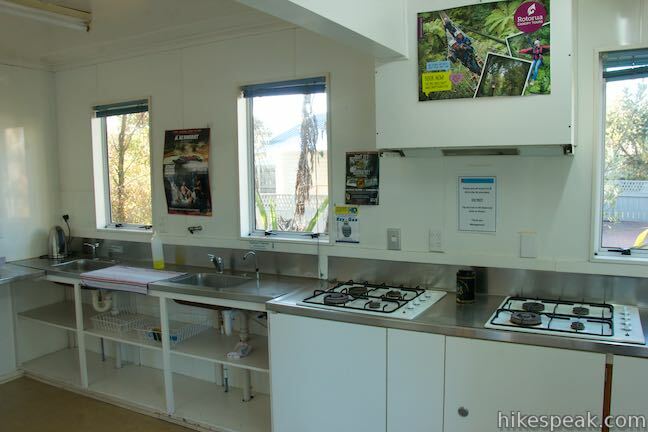 The kitchens have all the amenities you’d expect, including stoves, toasters, microwaves, electric kettles, refrigerators, and boiling water sources. As with all campground and holiday parks, you are responsible for bringing your own food and cooking and eating utensils. 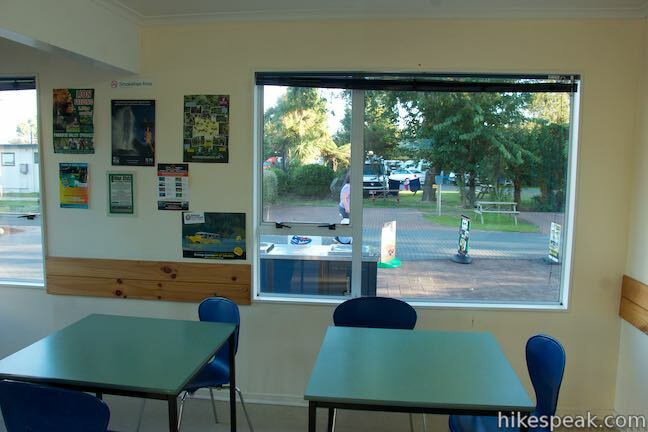 Tables for dining are indoors next to the kitchen and outside throughout the holiday park. The one bedroom cabins sleep up to six people. There are single beds and double/single bed bunk sets in the bedrooms as well as second sets of bunks in the front rooms. 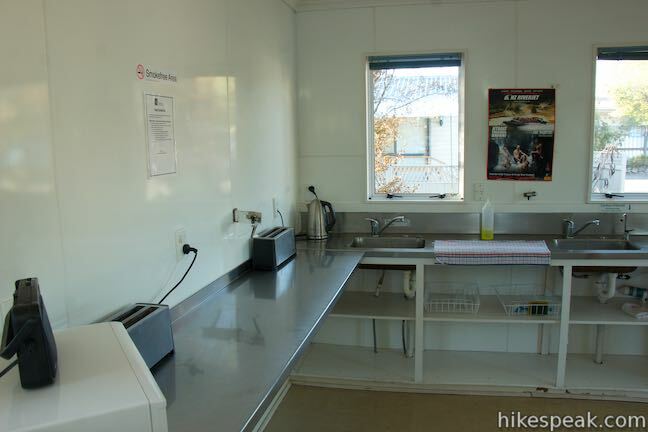 The cabins also have tables, and kitchenettes with basics like mini-refrigerators, toasters, electric kettles, and mugs. 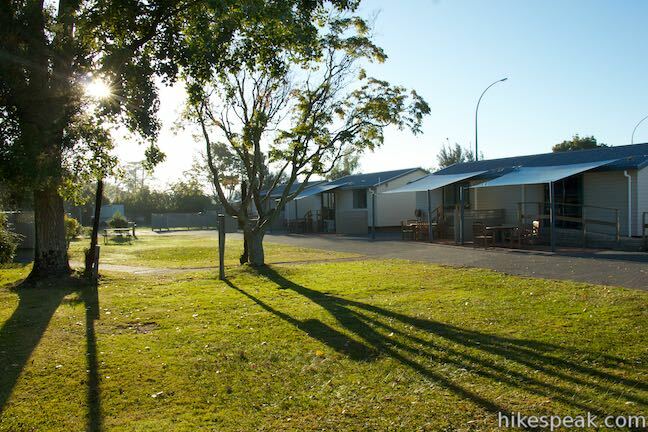 Guests make use of the communal showers and the other shared amenities that the campers have access too. Bedding is provided. However, guests should bring their own towels. 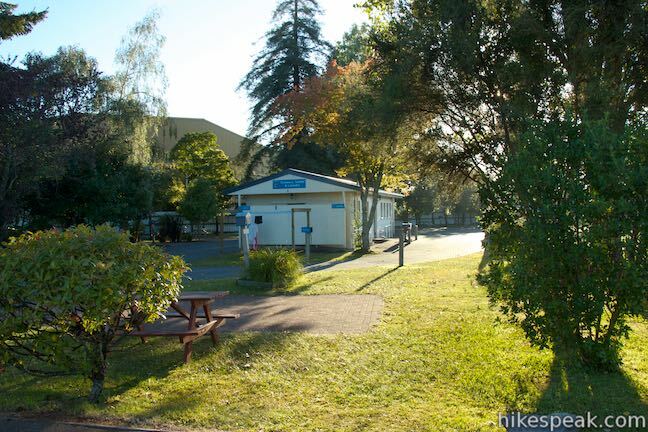 The cabin units are $65 to $100 per night (varies per season). Motel rooms range from $105 to $220 based on size and season. The hotel rooms have kitchenettes and other comforts you would expect like heaters, tables, alarm clocks, televisions with Sky cable packages and DVD players. 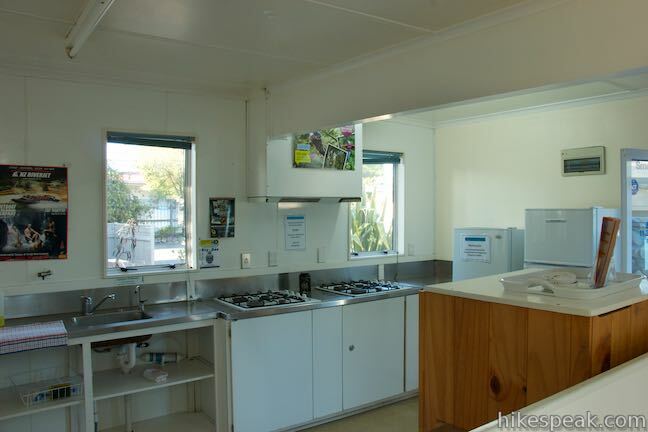 To see photos and view the differences between on the rooms, visit rotoruatop10.co.nz/accommodation. The most exciting features in the holiday park are the mineral pools, available to all guests. Every morning, the pool is filled with water from a natural below-ground source. One pool is heated to 40 degrees Celsius (104 degrees Fahrenheit) and 38 degrees Celsius (100 degrees Fahrenheit). 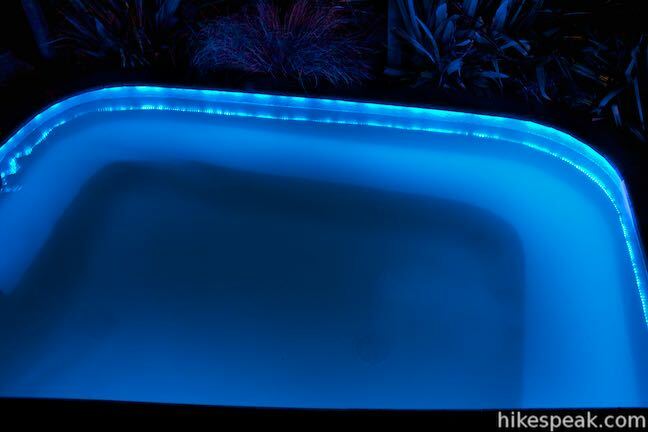 Blue LED lights illuminate the boardwalk to the pools (also lit in blue) in the evening, creating a great mellow atmosphere for the mineral pools. The pools close at 9 p.m. when they are drained and cleaned. 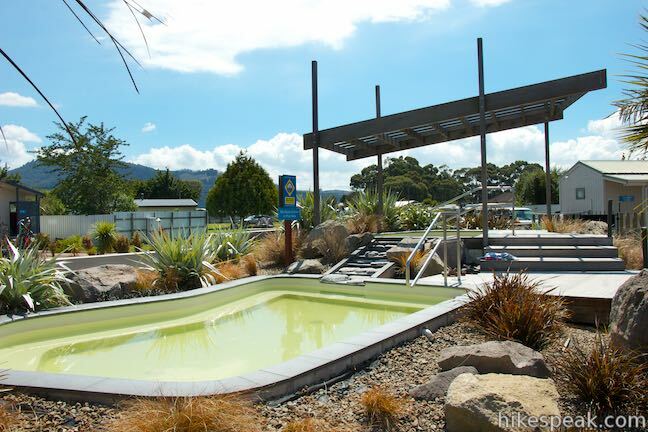 There is a sulfur smell all around Rotorua that is noticeable throughout the holiday park, particularly around the mineral pools. Check-in starts at 2 p.m. Check out by 10 a.m. Each room and site comes with parking for one vehicle. The charge for additional vehicles is a $10. Pets are not permitted. Wi-fi throughout the holiday park can be used for a fee. Some free data cards are offered to guests during booking. All prices have been listed in New Zealand Dollars as of 2015. 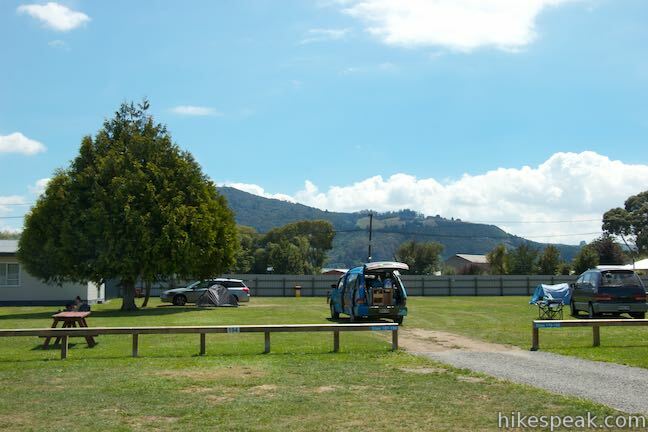 For more information and to book your stay, visit rotoruatop10.co.nz. 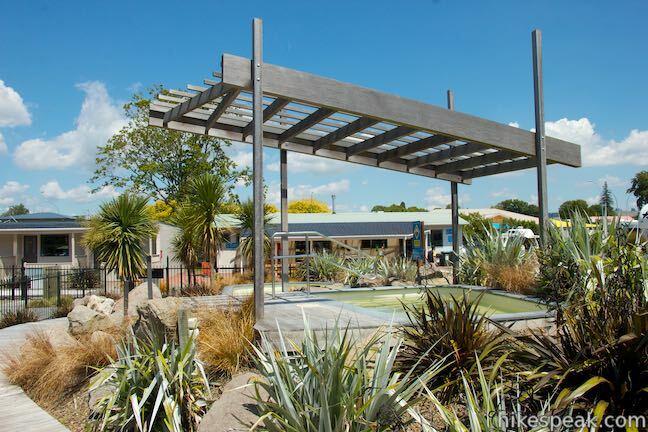 You can also email Rotorua Top 10 Holiday Park at stay@rotoruatop10.co.nz or call (64) 7 348-1886. 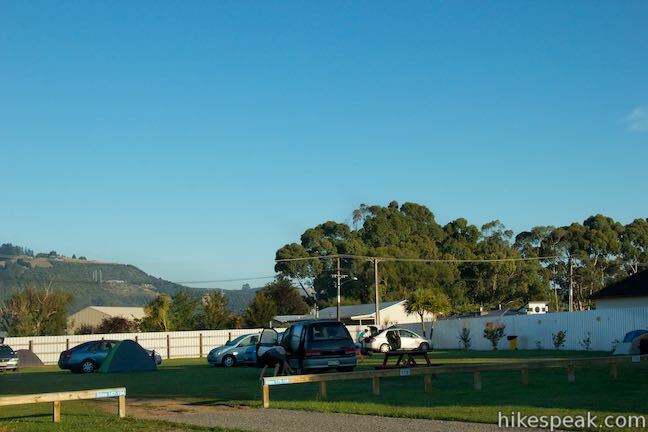 Directions: From the center of Rotorua, take State Highway 30A east from State Highway 5 for 400 meters. When SH 30A turns to the right, continue straight onto Pukuatua Street. The somewhat hard-to-spot entrance to the holiday park comes immediately on the left (north) side of the road.